You can see the list of contents and see some sample chapters on this website. This beautiful book is a loving and lavish portrait of a river so rich in history that, of its two-hundred-mile course, there is barely a mile that has not had a part to play in the story of England over the past two thousand years. 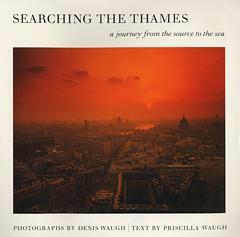 The text by Priscilla Waugh that accompanies each photograph describes her own exploration of the Thames; an exploration that took her, together with her trusty bicycle, into overgrown footpaths and derelict industrial sites in search of the river's past. Writing with affection and enthusiasm, learning lightly worn, a sharp eye for the telling detail and a gently humorous touch, she evokes for the reader the echoes of history that can still be heard in these places, by those who have the patience and the imagination to listen for them. This is an exceptional book. The pictures are the work of an artist whose camera can capture, like few others, the essence of a place, a time, a light, a mood. The accompanying text is a mine of information for those who wish to explore the river for themselves and to learn something of its long and fascinating history. For his fellow photographers, Denis Waugh has provided an Appendix giving technical information relating to the production of each photograph.